BRUNSWICK, ME – U.S. 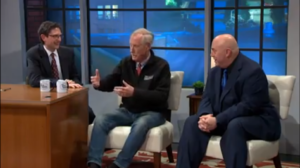 Senator Angus King last night joined The Nite Show with Dan Cashman, a late-night talk show that airs in Bangor, Portland, and Presque Isle on Saturday nights. Senator King spoke about the importance of civility in our political discourse, his time working with Senator John McCain, his work to fight the drug crisis in Maine, and his bipartisan work on the Senate Armed Services Committee to ensure that U.S. military recruits wear Made-in-America athletic footwear. Senator King has made combating the opioid epidemic a top priority and believes in taking a comprehensive approach to help people struggling with substance use so they can get healthy and re-enter the workforce. He has held a dozen roundtables around Maine to hear firsthand from people in recovery, health professionals, advocates, law enforcement officers, and concerned community members about ways we can tackle the crisis. In the recent bipartisan opioid bill, passed by Congress and signed by the president last month, Senator King pushed for a provision to permanently reauthorize nurse practitioners and physicians’ assistants ability to administer Medication-Assisted Treatment, which is critical for rural areas in Maine. Through his bipartisan work on the Armed Services Committee, Senator King fought to ensure athletic footwear be included in the Berry Amendment, which requires the U.S. military provide its personnel with American-made equipment and uniforms to the greatest extent possible. In doing so, Senator King helped facilitate a $17.3 million contract for New Balance facilities in Maine to manufacture shoes for U.S. servicemembers. To watch Senator King on The Nite Show, click HERE and HERE.